Never Tell is a tale about women. Intelligent, complex, damaged survivors who must come together to tell the story. Alternating chapters give us the perspectives of three people, piecing together this dark and tragic narrative. The murder is not straightforward. From the first moment outside forces come into play, including information from D.D.’s confidential informant. Flora Dane, a survivor of kidnapping and torture, recognizes the murder victim. She can’t turn away from what this means to D.D.—or herself. The three women tell the story through their own lives and perspectives, each somehow involved with the greater truth. How are the women’s stories connected? Which one of them is telling the truth? Which one is lying? Which one doesn’t know what to believe anymore? The answers will come, but to what end? 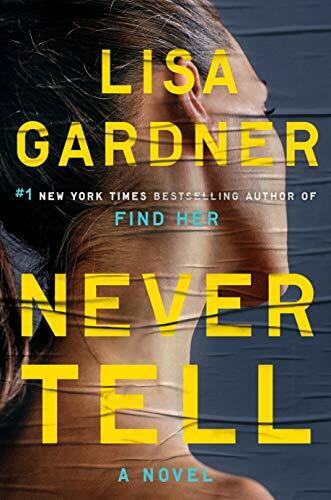 Never Tell is part police procedural, part inner discovery, part tutorial on what it means to be a survivor. The characters are well-drawn and compelling, the story dark and disturbing, but also redeeming. Gardner’s writing is beautiful, and the plot weaves together masterfully with detail and precision. Lisa Gardner, the bestselling author of more than 20 novels, proves once again her storytelling skill. For anyone looking for a suspenseful, gripping read, Never Tell will not disappoint.